Syracuse University Bookstore will host U.S. Senator Scott Brown for a book signing on Saturday, March 26, from 1-2 p.m. Brown will sign copies of his new memoir “Against All Odds: My Life of Hardship, Fast Breaks and Second Chances” (Harper Collins, 2011) on the main level of the bookstore, located in the Schine Student Center, 303 University Place. “Against All Odds” will be available for purchase. 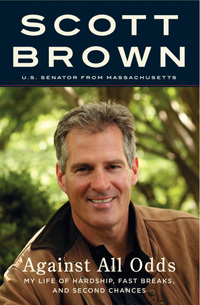 Brown burst onto the national political scene in 2010 with a major upset to the Democratic machine in Massachusetts. His greatest win, however, did not occur on that cold January night when he came from behind to capture the U.S. Senate seat held by Ted Kennedy for nearly 50 years—it began when he survived a savage beating at the drunken hands of a stepfather when he was barely 6 years old. According to Harper Collins, “Against All Odds” is the highly anticipated gripping memoir of the hottest rising star in politics today. It is a story of resilience and redemption, covering Brown’s difficult childhood, his brief modeling days in New York, his devotion to his wife and children and his triumphant election to the United States Senate. With clear-eyed conviction and unflinching candor, Brown tells the story of his sometimes troubled youth, of the coaches who mentored him and of how he found a way out of familial chaos through the swish of a ball in the net, winning a starting spot on the Tufts University varsity basketball team and becoming the 10th-highest scorer to graduate in the school’s history. His rise from there was meteoric: a first-year law student and member of the Massachusetts National Guard, he was picked as Cosmopolitan magazine’s “America’s Sexiest Man,” and was vaulted into the glamorous world of New York modeling at the height of the 1980s. Brown would return to Massachusetts to settle down and raise a family, and soon found an unlikely path that would lead him to national political stardom. The book details the unprecedented Senate race that captured the country’s imagination and how Brown won his remarkable victory. For more information, contact Leah Deyneka at the SU Bookstore at (315) 443-9900.